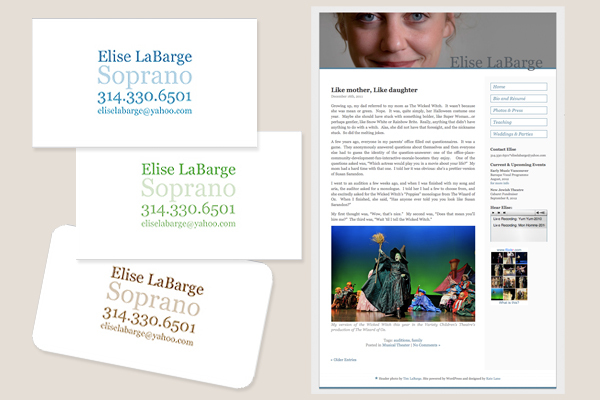 Business cards and website for soprano Elise LaBarge. Elise wanted something “interesting but not too crazy” and asked specifically that things be kept simple. The business cards were printed in various colors to coordinate with the atmospheres at different functions — brown at funerals, perhaps, or green at spring weddings. The design of her artist website, used to promote her performances and teaching jobs, was intentionally kept very clean — a simple yet engaging headshot was used for the header and the site’s palette pulls from her blue eyes.